Written by Anthony Del Col, Conor McCreery, art and cover by Neil Edwards. Charlotte de la Cruz is overeducated and underemployed, wasting her time in a dead-end job in San Diego, and spending her free time chasing down conspiracy theories on the dark side of the internet. When a real-life conspiracy crashes into her life, she's pulled into the orbit of the Assassins, a mysterious organisation of principled killers with roots stretching back thousands of years - and users of the stolen Animus technology, which allows them to experience the memories of their ancestors as if they were there! Charlotte has a secret in her blood... the genetic memory of an ancestor who was in Salem at the time of the infamous witch trails: Tom Stoddard, an Assassin who witnessed a dark act with repercussions for the present day! As Charlotte is trained in the Assassins' art, and as she begins to investigate the life of her ancestor... the forces of the Templar Order move against her. Will Charlotte learn the skills she needs to survive, and the truth she needs to prove her worth -- before the Templars silence her forever?! Written by Seamus Fahey, Zach Craley, art by Rubine Cubiles, cover by Paul Pope. Written by George Mann, art by Emma Vieceli, cover by Alice X Zhang. 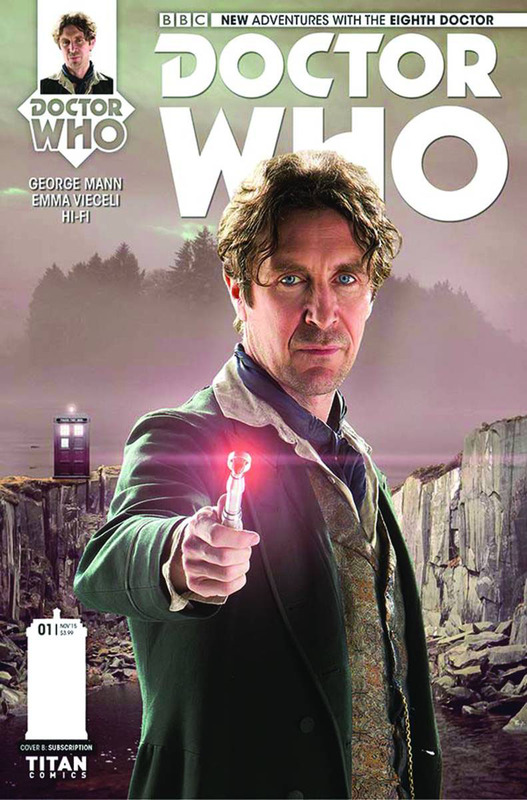 "I'm the Doctor, and i'd very much like to know what you're doing in my house..." Get ready for an all-new season of comics adventures featuring the eighth Doctor, as played by Paul McGann in the Doctor Who movie, fan-favorite minisode "Night of the Doctor," and over fourteen years (and counting!) of astounding Big Finish audio spectaculars! Five amazing, interconnected new stories take the Doctor on a rollercoaster of threat and misadventure, as he investigates the mysteries surrounding his new companion Josie. Victorian magic shows, murderous trees, lost books, crystalline life-forms, barges in space crammed with the undead -- and the grand journey all begins in a sleepy Welsh town besieged by living paintings! Written by Paul Cornell, art by Neil Edwards, cover by Neil Edwards, Ivan Nunes. Written by Cavan Scott, art by Blair Shedd, cover by Alice X Zhang. Leaving World War II behind, the ninth Doctor, Rose, and Captain Jack discover that Time Lord technology, lost in the wake of the Time War, is being sold on the intergalactic black market! Now the threat of a new temporal war brews on the horizon, with the Doctor and his friends caught between the twin threats of the Unon and the Lect, two species with intertwined histories who are jostling to replace the Time Lords on the universal stage. Can the Doctor stop history repeating itself? Collects Doctor Who: The Ninth Doctor #1-5. Written by Nick Abadzis, art by Eleonora Carlini, cover by Alex Ronald. It's chaos aboard Presley Station, as the corrupted Shan'tee -- conceptual beings from a different order of reality -- prey on the human colonists, while on the gas giant below, vast storms conjure up winds of horrifying speed that threaten to tear the Station apart! Caught in the middle of the chaos: the Doctor and Gabby! Can the Doctor find the counter-melody that brings peace back to the Station? And can the ever-humming Gabby keep herself from singing to stop her mind being invaded by a sentient song? Meanwhile, back on Earth, Cindy makes up her mind. And in deep space, an old face comes calling! Written by Simon Spurrier, Rob Williams, art by Simon Fraser, cover by Alex Ronald. The breathless chase through time and space continues, with the Doctor and Alice on the run over a crime committed by one of his previous incarnations! Things get complicated -- quick -- as a chainsword-wielding freelancer boards the TARDIS. Is he friend, foe, or something even worse? With only minutes left before the implant in Alice's head gives their location away to the transtemporal bounty hunters on their tail, the Doctor won't have time to weigh his options -- and the consequences will be heavy! Written by Robbie Morrison, art by Daniel Indro, cover by Alex Ronald. It's the penultimate chapter of "The Hyperion War," and things are looking bad for the Doctor and Clara! With the returning Hyperions having laid waste to whole portions of the Earth, the Doctor attempts to regain the initiative by moving the battleground into space, aboard the Hyperion's orbital armada. But these ancient solar entities are building a superweapon around the sun -- and eternal darkness could be the result! Written by Andy Diggle and various, art by Andy Kuhn and various, cover by Mark Buckingham. In this final volume of The Eleventh Doctor Archives, follow the Time Lord and his new companion Clara Oswald through the dark depths of time and space! Woeful white holes cause time-hopping troubles, an ancient evil from Gallifrey's past stands revealed, and a trip to the Wild West turns into a murder mystery with an unexpected host of historical characters! Plus, in The Girl Who Loved Doctor Who, see what happens when the TARDIS is flung into our universe, as a young Whovian comes face-to-face with her hero! Written by Nicole Dawn Phillips, art and cover by Beni Lobel. The deadly game played out on the streets of Washington takes a dramatic turn when Raymond "Red" Reddington finally tracks down the true mastermind behind the attacks. Now the race is on to stop an assassin with a 100% success rate from claiming his next victim. Written by script coordinator Nicole Dawn Phillips, The Blacklist comic chronicles the extended exploits of former government agent Raymond 'Red' Reddington, taking us back to the very origins of the series and revealing secrets about Red's past and how he formed relationships with some of the key characters from the show. Written by Mark Landry, art by Ashley Witter, cover by Nick Runge. Haunted by the catastrophe that tore his city apart ten years ago, Coast Guard veteran Virgil Lafleur struggles daily with the hardships of a post-Katrina New Orleans. But when his younger brother's murder leads him into a vortex of intrigue, corruption, and violence, Virgil becomes obsessed with bringing the killers to justice and exposing the horrific secret hiding beneath the Mississippi. From screenwriter Mark Landry and artist extraordinaire Ashley Marie Witter comes this visceral revenge thriller that merges the real-world hopes and horrors of a post-disaster community with an engaging thread of political corruption, class divide, and blood-curdling terror! Written by Montynero, art by Martin Simmonds, cover by Montynero. Roots battles Retch for control of the streets -- and graduates to the big-time! Ex and Roots take the fight to London's two-faced Mayor, but their actions could spark a war! Verity meets with journalist Fincham to make her story public -- but the government, the FBI, and the street gangs of London will do anything to keep her silent! And introducing the Young Praetorians! Written, art and cover by Andre Araujo. Despite successfully thwarting the cyborg threat and returning order to the streets of Olissipo, questions still remain unanswered for the city's SOF; what's to become of the renegade android and will the truths behind her creation ever come to light? The concluding chapter of this high-octane dystopian thriller that whisks the reader into the thick of a robotic skirmish and the unsettling conspiracy that lies at its heart. 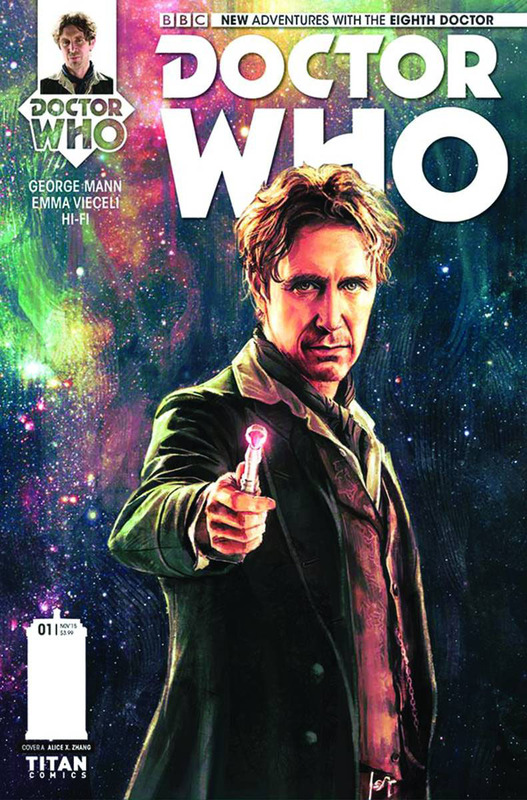 Written by Ben Aaronovitch, Andrew Cartmel, art by Lee Sullivan. What's the link between a circle of wizards killed in the Second World War, a homicidal car and an ancient ducking stool used to torture young girls? London cops Peter Grant and his boss, Inspector Nightingale, are in a race to find out before more people die! Written by Doctor Who writer Ben Aaronovitch ("Remembrance of the Daleks") and set in the world of his own bestselling novels, with Doctor Who script editor Andrew Cartmel! Written by Jean-Francois D. Giorgio, art by Frederic Genet. Released in English for the first time ever comes the latest installment of Jean-Francois Di Giorgio and Frederic Genet's epic Samurai series. In search of his long-lost brother, Akio, Takeo discovered an island in disarray. Ruled by the heavy hand of Lord Nubunaga and his clan, a deadly sickness has infected many of the island's peasants who long to recover their island's lost name. Reunited with his brother, and haunted by dreams of his youth, Takeo is determined to uncover more of his past. But first, he must face the notorious Shobei, an unbeatable Samurai determined to honorably join his wife and daughter in the after-life by dying in combat. Is Takeo a worthy opponent for this legendary warrior? Written, art and cover by Des Taylor. Beautiful. Intelligent. Deadly. Scarlett Couture is all of these things, and more. She's a spy. Using her cover as Head of Security for her mother's internationally renowned fashion house, she gathers intelligence for the CIA. In this explosive first issue, Scarlett follows her instincts right into the middle of the action and finds she needs to use all her wits to get herself out of hot water! The high-octane critical and sales hit, collected in one explosive volume. Collects Scarlett Couture #1-4. Inside this fangtastic howliday issue, the ghouls are making spirits bright! Check out this season's scary and bright styles, take a freak peek inside Cleo de Nile's diary and get creative with creep the halls crafts. There is also a new Fright-Mares comic to get your cool claws on and fangs more! Written by Dan Abnett and various, art by Alex Dalton and various. Get ready for some top-notch classic tales starring Kung-Fu Panda and Shrek! Ahead of his brand new movie, check out these Kung-Fu Panda adventures as Po and the Furious Five face hordes of ninja and a tricksy samurai! Plus, join Shrek in "Donkey Ride," where Prince Charming challenges Donkey and Puss, and "Consequences," where a group of water nymphs cause trouble! Written by Max Davison, art by TBD. What is an alien scared of? Well, the Boov alien Oh gets particularly scared when Tip tells him some ghost stories around a campfire. Oh decides to man up and prove he isn't a coward! Will he succeed? Get ready for spiders, clowns and more... Eeeek! Written by Simon Furman, art by Lee Robinson. Po has been a busy Kung-Fu Panda! He's had 2 hit movies, a successful television show, and there's another exciting movie on the way! And now he's set to get even busier in his brand new comic! Join Po, The Furious Five, and Shifu -- and their enemies, too! -- for brand-new adventurews. This issue kicks off a special two-part story, "Wake Me Up Before You Po-Po." Written by Simon Furman, art by Iwan Nazif. Po can't get out of bed at the best of times, but things get really weird when a strange sleeping sickness affects the Valley of Peace. The whole town is out of action except for Po, the Furious Five and Shifu whose training helps them resist the sensations. With their fighting edge blunted, can the group battle against the enemy behind all of this? The Valley of Peace is rocked by a raging elemental storm that seems to have a life of its own. Po is just about capable of fighting anyone -- but how can he battle the elements? And is a mystery villain behind the stormy situation?